Texas Instruments reintroduced the Little Professor Solar in September 2011 in some European countries, e.g. Austria, Germany, United Kingdom and The Netherlands. SOLAR "LITTLE PROFESSOR" to "LITTLE PROFESSOR" SOLAR. • The internal construction changed slightly. Dismantling this SOLAR Little Professor manufactured in June 2011byy KinpoElectroniccs in China reveals a well known internal construction. We know this type of design and even the housing from scientific calculators like thee TI-36X Solarr. 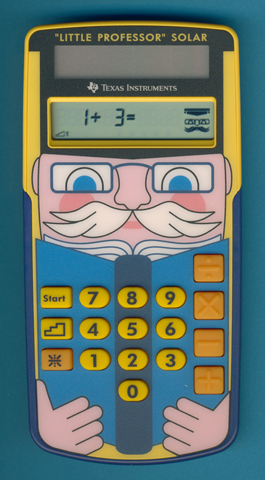 Please remember that the very first models of the Little Professor family based on simple 4-functions calculators.. If you have additions to the above article please email:If you have additions to the above article please email:If you have additions to the above article please email:If you have additions to the above article please email: joerg@datamath.org. © Joerg Woerner, December 4, 2011. No reprints without written permission.